The Manhattan Business Hotel (MBH) is named after one of the exciting and bustling districts in New York City, through inspiration by the style of living in Manhattan where business and home living is integrated. Our business hotel is themed with the beautiful Manhattan settings, which offers guests with a unique experience of stay with a homely Away-from-Home feel. MBH offers peace of mind staycation at a reasonable price. Every effort is made to make our guest feel comfortable and welcomed. MBH don’t offer the extravagant facilities of most Resort Hotels, but only the necessary facilities, services, comfort and safety environment of any business hotel that will serve as a practical extension of your daily life during your stay with us. Whatever your reason for visiting, Manhattan Business Hotel is the perfect venue for an exhilarating and exciting break away. 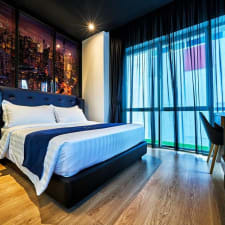 If you desire to stay in a Manhattan-style hotel, splurge on a shopping spree, and simple fine dining, then The Manhattan Business Hotel TTDI is the perfect selection for you.